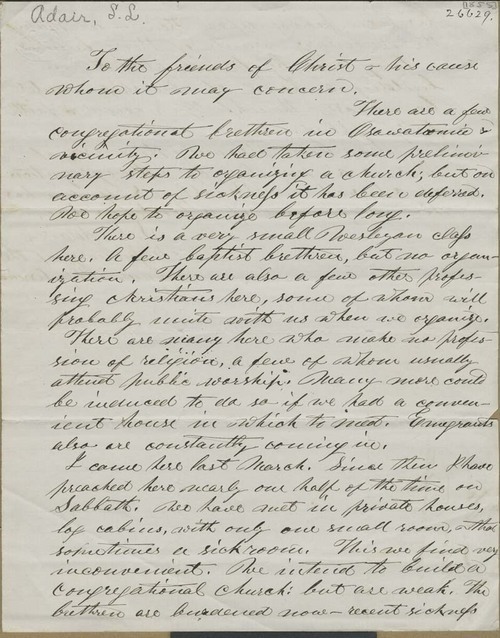 This letter reported on the current religious situation in Osawatomie, Kansas Territory. According to the author, a missionary with the American Missionary Association, the residents had begun the preliminary steps for organizing a church. In Osawatomie there were a number of Baptists, Congregationalists, and Wesleyans, along with a large group who "make no profession of religion." Adair also wrote about the sickness that prevented more formal organization.